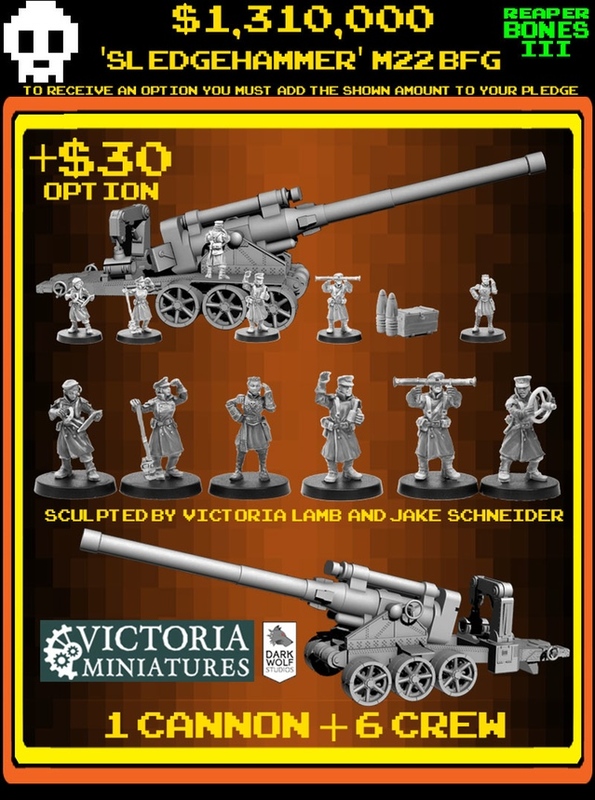 There are lots of opinions around what scale 25/28mm miniatures our especially since manufacturers produce minis that while obstinately are 25/28mm vary greatly in size, proportion and appearance. There is a trend for WWII vehicle kits to be produced in 1/56th scale both in plastic and in resin and I'm throwing my hat into that ring. 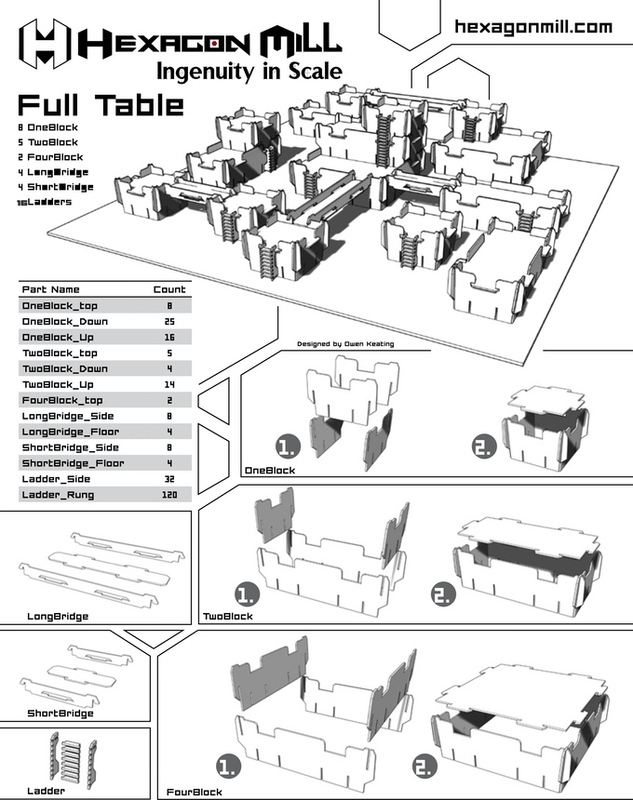 When I scratchbuild buildings I like to build in a scale and 1/56th is the one I have settled on for my town of Calamity. 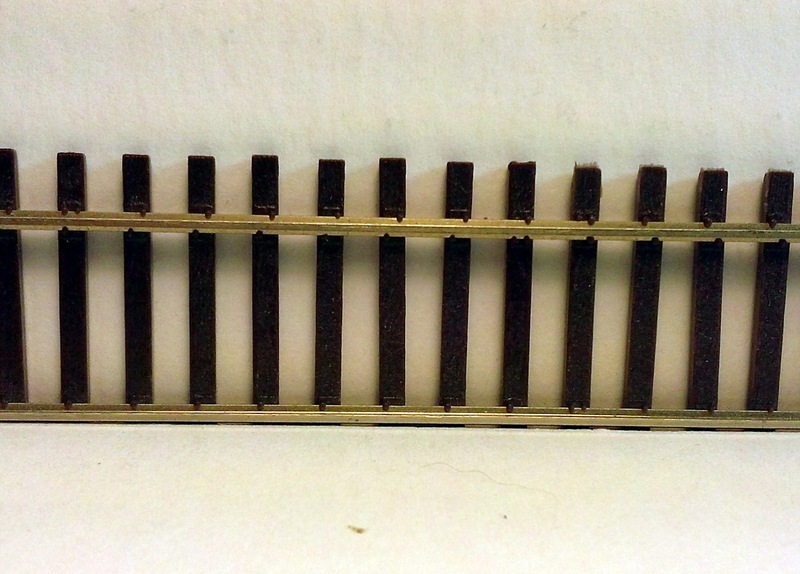 But even there I don't restrict my self to "scale" parts first because almost nothing is actually produced in that scale and second because why should I restrict myself to a scale when parts from any of the railroad scales will work? In the end if the proportions look good then use it! I'm actually not trying to fan the flames of the scale wars but I was challenged to provide proof of why I feel that 1/48 is not only to big but way to big to be the "scale" of our 25/28mm miniatures as well as the Heroic versions standing closer to 30mm. I'm firmly in the camp of 1/56th as the best compromise scale. 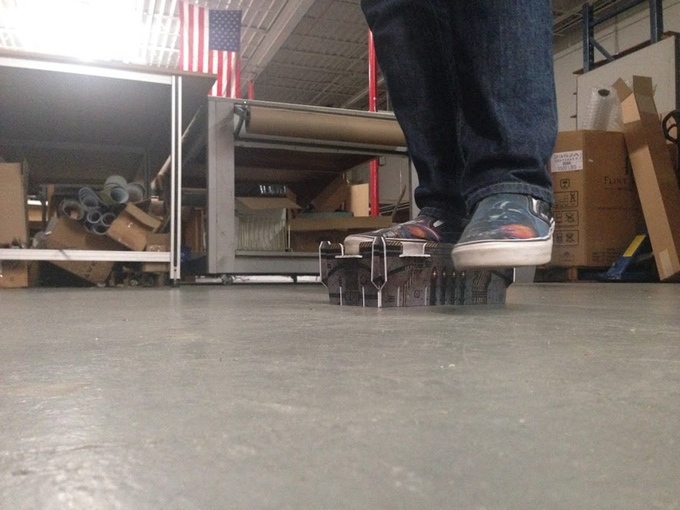 Unfortunately that precludes the use of the the railroad scales at least in the US; 1/64th or S scale and 1/48th or O Scale. 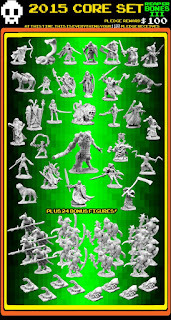 Since sizes of minis tend to very quite a bit between miniatures I picked out a variety of miniatures to use as examples. 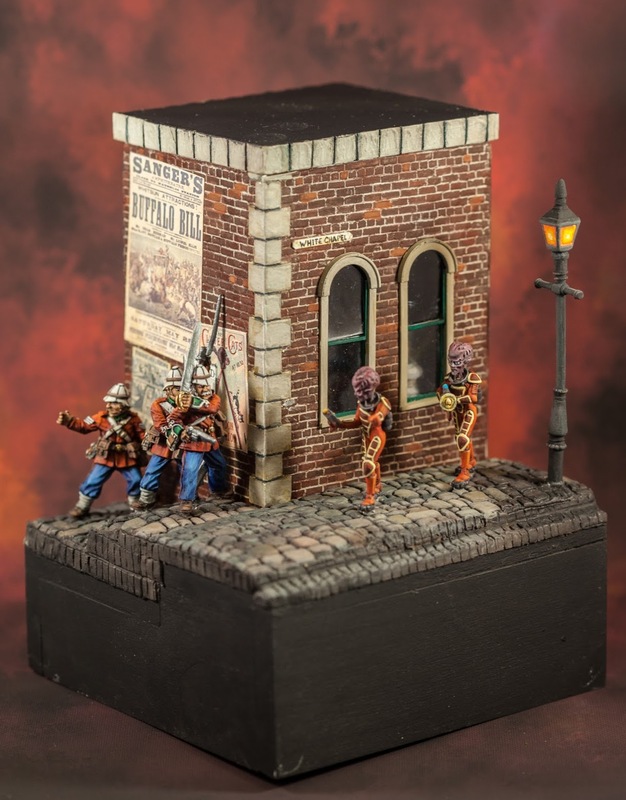 They come from Black Scorpion, Reaper Miniatures, Dixon, Wargames Foundry and Knuckleduster. 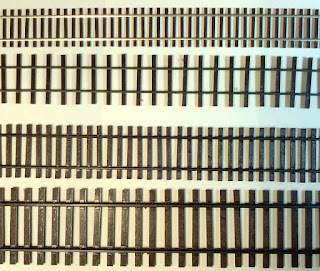 For scale examples I'm using flex track in the following scales and sizes: HO standard gauge, On30 (O scale but narrow gauge using the same spacing as HO), S standard gauge and O standard gauge. I have also included pictures of the setup I used. My goal was to have the top of the bases that I use (and they are all on the same brand of bases) level with the inside edge of the bottom rail. Then I took a few group shots standing against the track as well as some singles against the O standard gauge track to really show just how short our minis are against it. On30, exactly the same spacing between the rails as the HO standard, only the scale has changed so in this case the distance represents 30" rather than 4' 8 1/2" as it does in the HO shot. S Scale, getting much closer again the distance between the rails is 4' 8 1/2". I like the feel of this and this is what I would like to use but equipment in S Scale is hard to find and somewhat expensive. rails is 4' 8 1/2". Only a couple of these miniatures are going to be close or over 5' tall based on the photo. 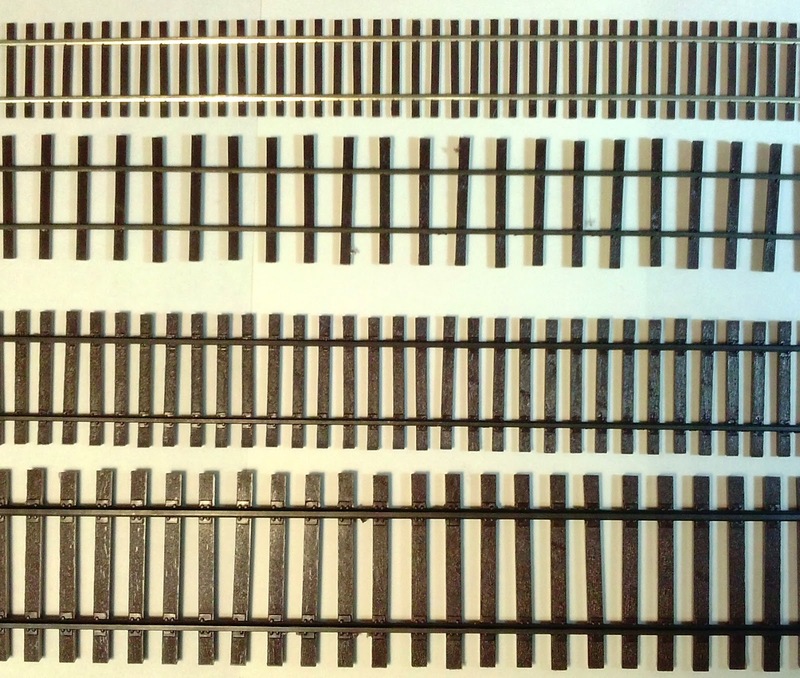 All the following are closeups of the miniatures compared against the O Scale Standard Gauge track. Yea, this guy is barely over 5' tall. 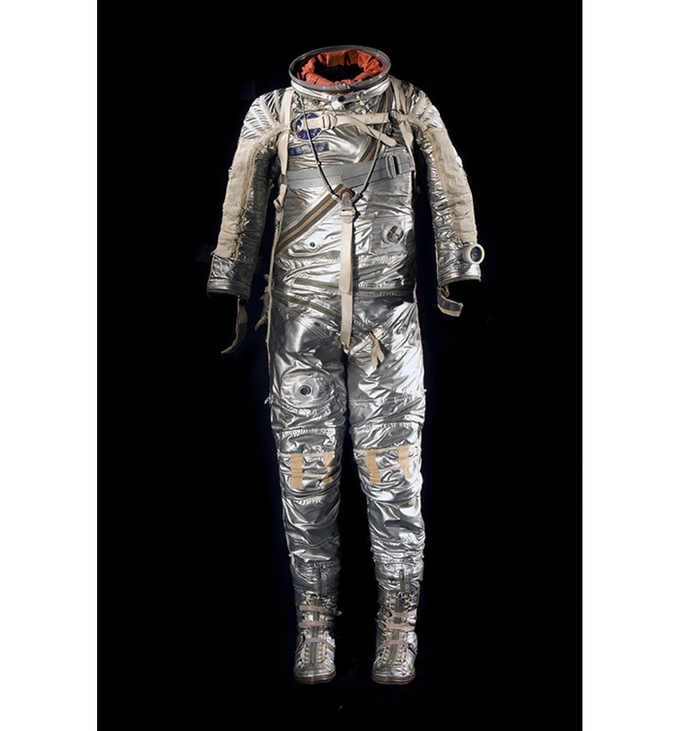 Shepard was launched into space on top of Mercury-Redstone 3 in the Freedom 7 capsule on May 5th, 1961. 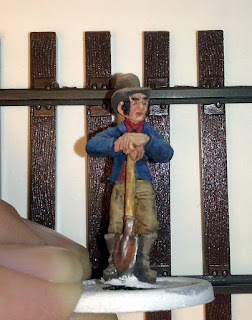 A week ago I was excited and jumping up and down about the new AWI minis I received from Fife and Drum (seriously go buy some). 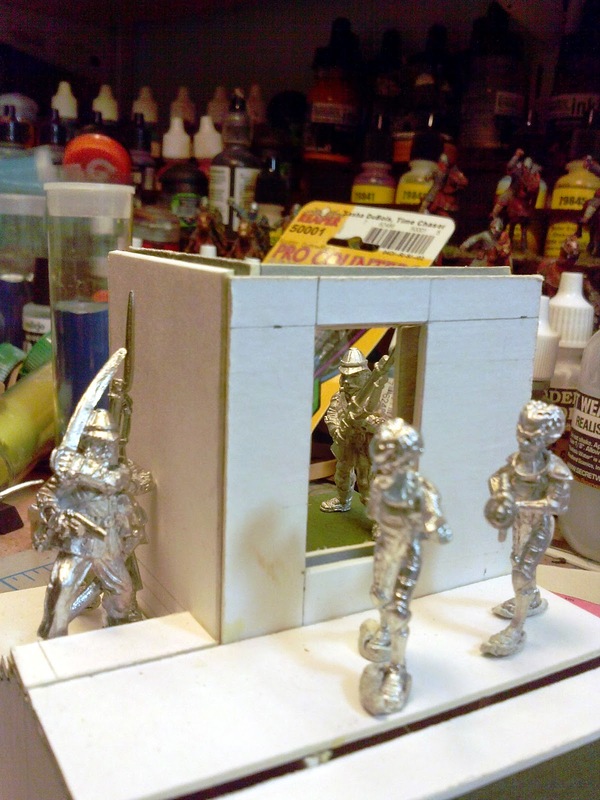 I prepped them and mounted both those and some Wargames Factory miniatures up for priming and painting. About half way through the process my airbrush clogged. I had noticed that my Vallejo primer was a little thick but didn't thin it like I should have. I sat down to clean it up and managed to ruin one of the O rings. While not catastrophic is does make it pretty much useless as a tool right now. 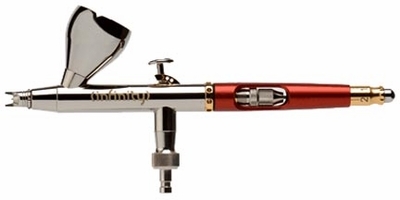 I ordered parts from Chicago Airbrush Supply and I'll be up and running again as soon as they arrived. Then I can finish priming and get some paint on my first foray into the AWI. In fact my parts did arrive today and I'm up and running again, the delayed AWI are now primed and ready for paint. One of my AWI reference books. 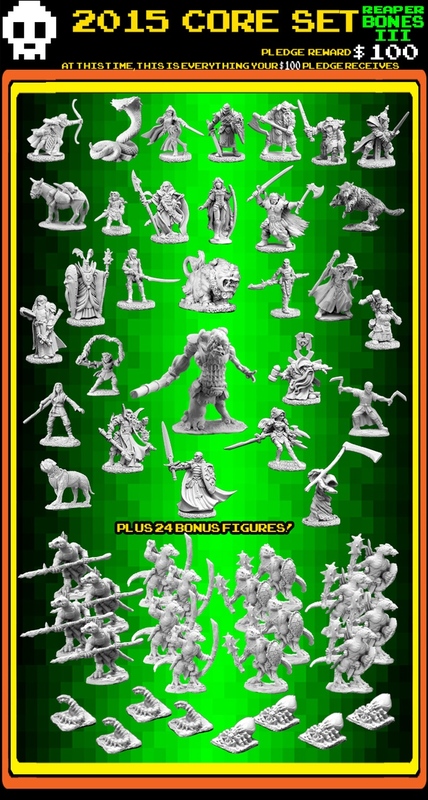 This 18 day Kickstarter from Reaper closes down tomorrow (Saturday 7/25). 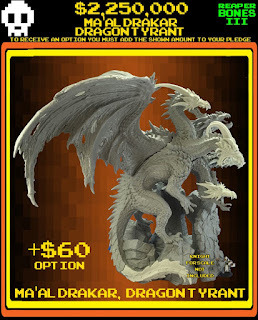 The penultimate piece that has been discussed the Not Tiamat or Tianot was shown off a couple of days ago. Now known as Ma'aldrakar this five headed monster is truly a monster. 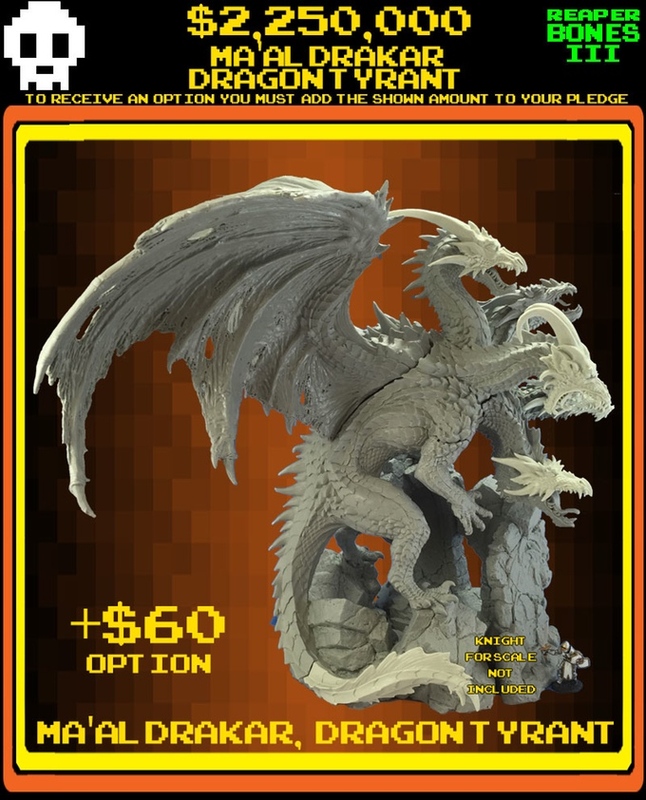 It dwarfs both Kaladrax (the bone dragon from BONES I) and Dragons Don't Share II (one of two big bad monsters in BONES II). 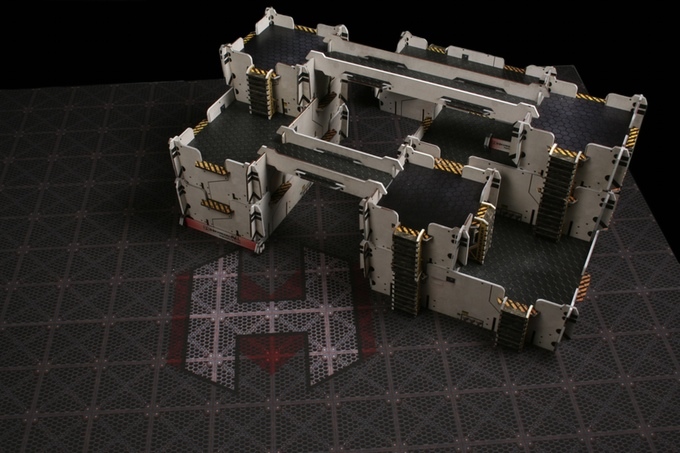 This is truly a monstrous piece and its priced at $60 as an add on option. While some people seem to be upset with that price it was mentioned that retail its probably going to be between $120 - $160. Which at a minimum makes it half price. This stretch goal kicks in at 2.25 million dollars and it looks like they should be able to hit that goal and produce this monstrosity. Really one GM doesn't need a 5 headed dragon sitting on the shelf. It should really help keep the players in line! Note Sir Forscale down in the lower right corner/ That should give you an idea of how big this thing is. Maal also makes an appearance in at least one of the videos so take a moment and check out all the cool stuff. So here is a Kickstarter near and dear to my heart. 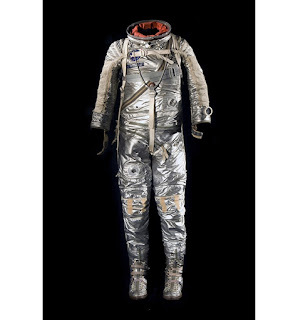 The Smithsonian needs funds to restore Neal Armstrong's spacesuit for display in time for the 50th anniversary of the moon landing. 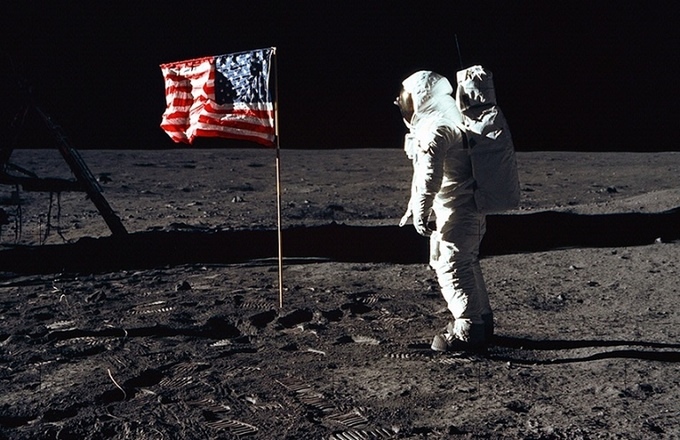 Its one of those momentous events that you remember exactly where you were and what you were doing when it happened. This needs your support. I was going through the TMP forum last week and der Alte Fritz had a post showing off some new armed civilian miniatures from the Minden Seven Years War line he stocks along with his own Fife and Drum miniatures. He was offering a deal for militia set #1 featuring the 5 Minden minis along with his own Militia as a package deal. 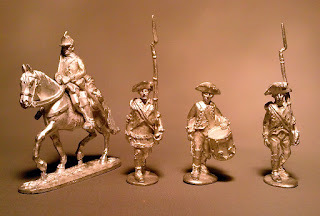 I have wanted to check out Fife and Drum minis and getting a selection from both lines seemed like a good way to go so I sent him and email and, unexpectedly, the minis arrived today. Now that's some seriously prompt service! 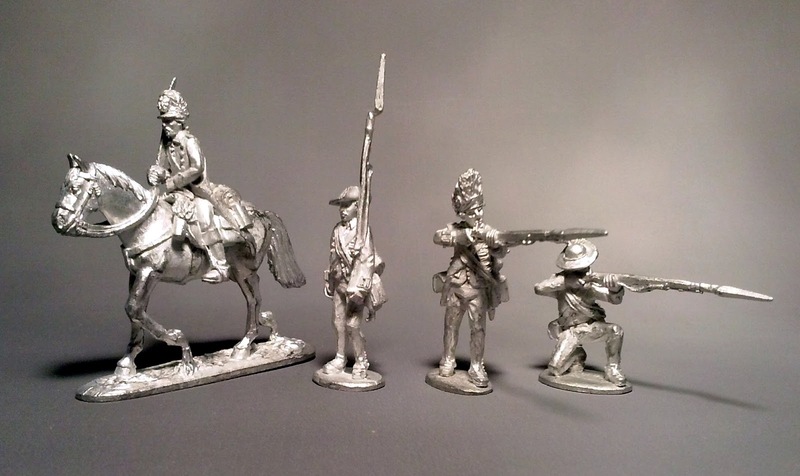 I had mentioned that I was just breaking into the period so he also sent me some samples of Fife and Drum British and American infantry and cavalry. 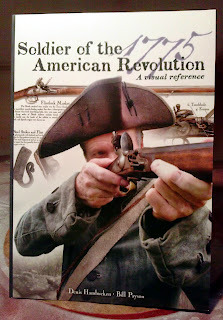 Also in the box was a pack of his Spirit of 1776 miniatures. I'm seriously impressed. 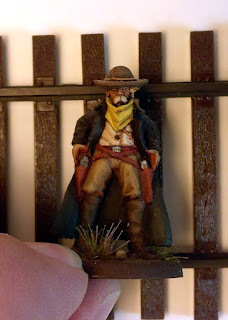 I have seen pictures on his website and on the table but there is nothing like seeing a quality miniature in your hand. 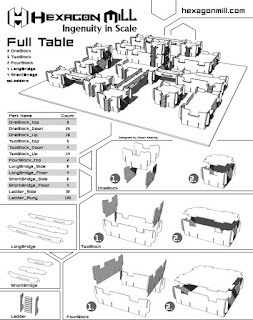 I had some plastic Perry and Wargame Factory plastic boxes (unbuilt) at my desk and I pulled them out to compare them all. 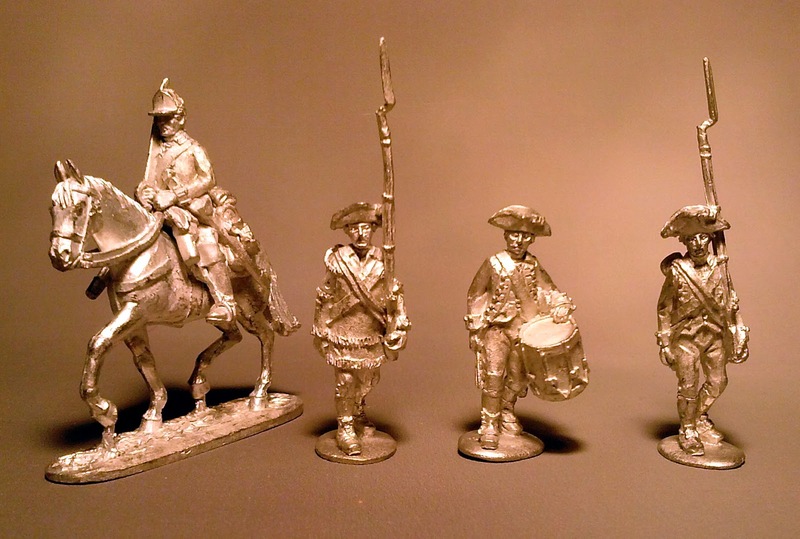 The Fife and Drum matches up very nicely with the Perry Miniature plastics and are a bit short compared to the Wargame Factory plastics. 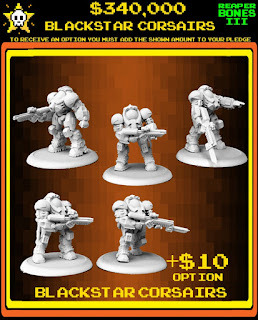 I don't really plan on mixing miniatures within units but its nice to know that you can. I think I'll clean these up and get some primer on them before hockey tonight. Shouldn't take much time to clean them up, the castings are very clean, very nice. 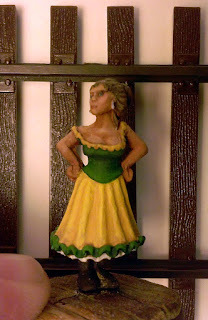 I'll definitely be adding some more Fife and Drum miniatures to my AWI collection! I'm always on the look out for new painting books. I was going to pick this one up based on a short review on another blog (and I don't remember which one now, and it might have been a youtube video) so when I needed some new pigments I went with Ammo (yet another Mig Jimenez company) so I could pick up the book as part of a combined book/pigment deal. I was going wait and do a review until after I had finished my Tank Destroyer Company but that has come to a complete halt until I either find my US decals or I breakdown and order more. Since the initial steps were going well I figured a review didn't really need to wait. 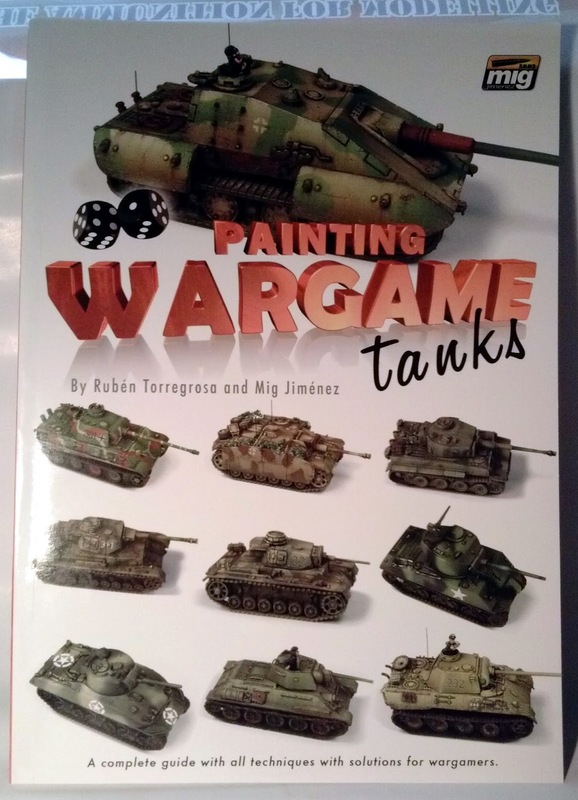 Painting Wargame Tanks is authored by Ruben Torregrosa and Mig Jimenez (although I expect most of it was written by Ruben). Its broken up into three sections; materials, basic method and advanced method. The advanced method accounts for about 3/4 of the book. Fair warning this book is a big advertisement for Ammo products, everything in the book can be acquired from a different companies though so don't feel like you have to use Ammo products to get these results. 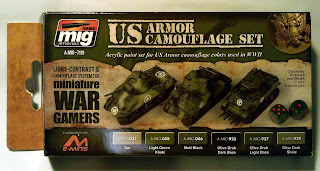 I'm using them to paint the Tank Destroyer Company because I wanted to try them out, but if you already have your own stash of materials feel free to use them. The one thing I did find slightly irritating is that they don't even mention which company's models they are using. My guess is mostly Battlefront and Plastic Soldier company. There is definitely a bias towards the plastic kits which would lean towards these two companies. 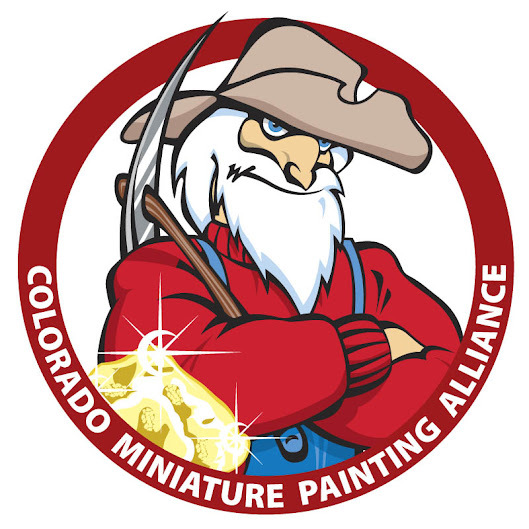 The materials sections goes over the different types of paints used (both acrylic and enamel) as well as a basic introduction to the airbrush. Use of the airbrush is heavily featured in this book and does a reasonable job a describing some of the more advanced techniques that you might use it for. If you are new to the use of pigments these are described here as well. This section is pretty brief but there is good information here. 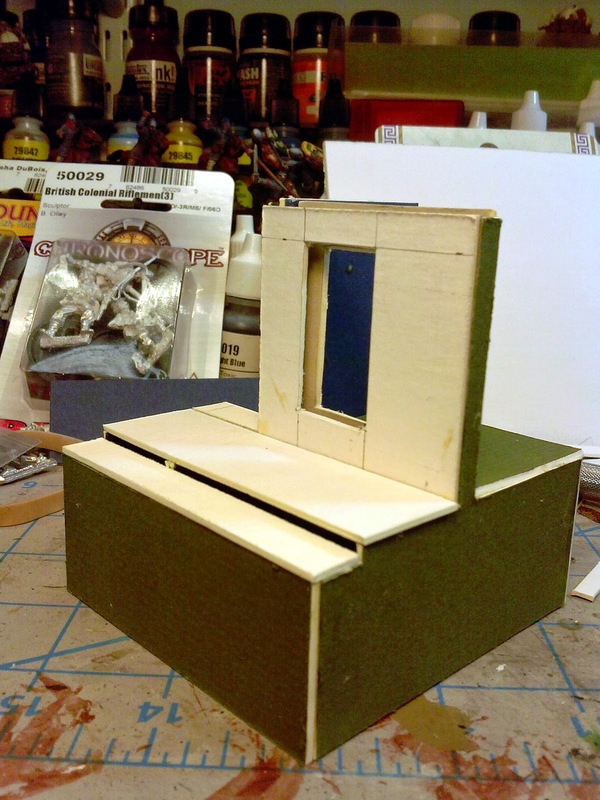 The book then dives into the basic painting method, which introduces a couple of techniques that you aren't likely to find on most wargame tanks; streaking and dusting with pigments. While Battlefront introduced pigments into their line a number of years ago I don't think the use really caught on with the gaming community. This book does a much better job of explaining how to use them. 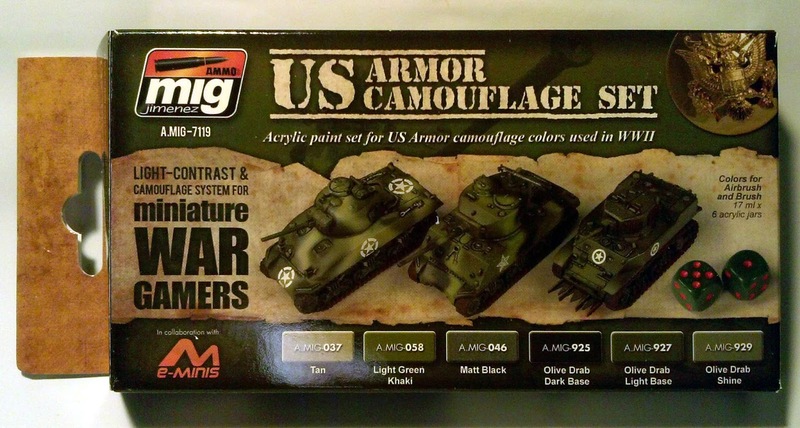 In the basic "way" they paint a M4A1 Sherman, an M5 Stuart and a PzKfw VG Panther. For each vehicle they go through a step by step approach\ which really does cover everything although the descriptions of what they are doing are a bit brief and the pictures are a bit small. It does a good job of capturing what is being done, how it should be applied and what material is being used. There are a couple of small gaps but nothing that can't be figured out. The section ends with some final tips for finishing off your vehicles. 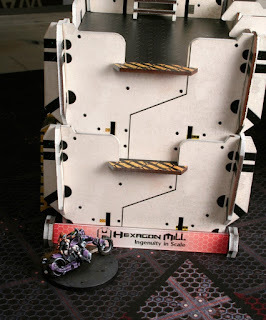 You can stop here, the additional techniques are more than enough to make your tanks and other armored vehicles stand out on the table. All of the techniques are applicable to any vehicle whether its a jeep or a panther. 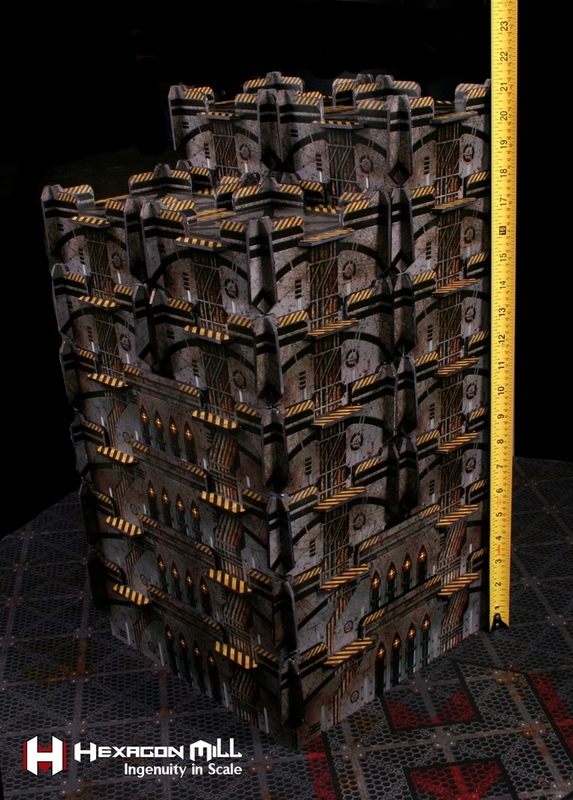 The meat of the book is in the advanced "way" section, which makes up the bulk of the book. The emphasis here is decidedly on German vehicles but it doesn't take a lot of intuition to be able to apply them to another other nationality's equipment. In this section they cover the following; E100 Jagdpanther, PzKfw V, PzKfw IV, PzKfw III, SdKfz 251 (could be an A, B or C), T34 and a PzKfw VIE Tiger I. 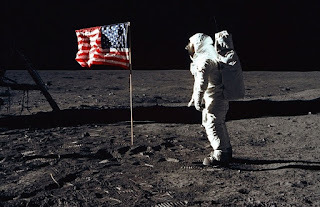 As they go through the step by step process all of the basic information is still present, they don't skip any steps assuming that you know it now. I like this as it gives a full road map going from point A to point B. 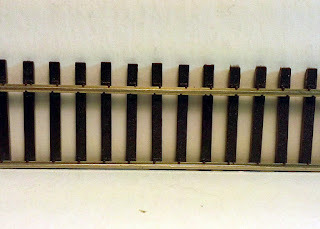 The first airbrush technique used is modulation, which is varying the base color of different panels on the vehicle to provide an initial base for shadows and highlights. They also introduce masking for doing hard edged camouflage (both with masking tape and putty). 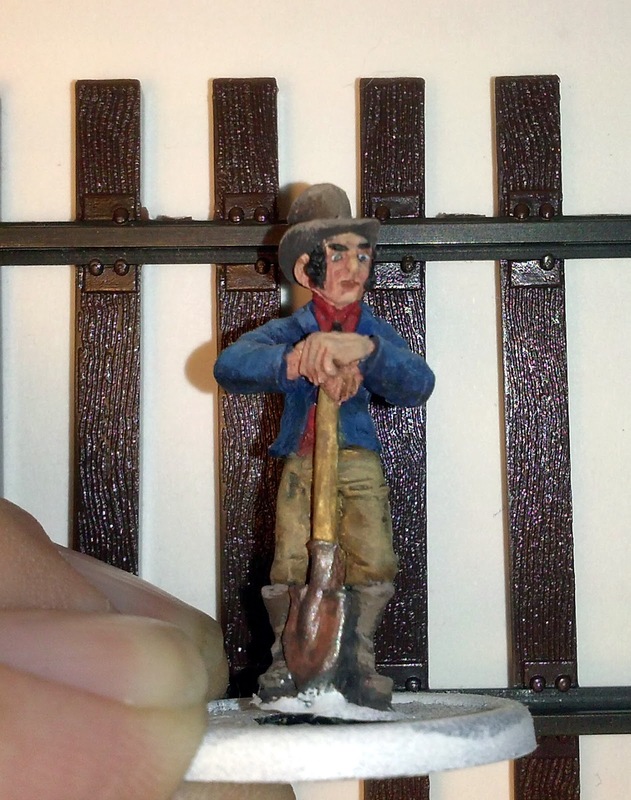 This process continues through the section by adding techniques like chipping and the application of mud. For the most part quite well done although, like the basic section, there are a few gaps that you might have to puzzle through. Overall I"m quite pleased with this book. The steps and materials are clearly defined and how you apply them is reasonably explained and understandable. While they didn't introduced any techniques that were new to me it was nice to have everything consolidated into a single book for reference. There were a couple of things that annoyed me. 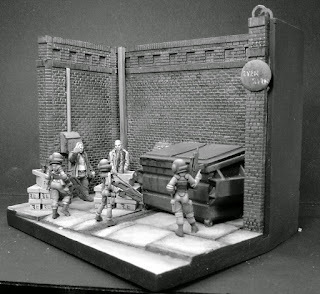 Not giving credit to the manufacturers of the models themselves (which I actually find somewhat unusual) and a lack of description in some places where actual modeling took place. For instance the PzKfw III went through some additional modifications and it would have been nice if they had gone into some more detail there as that is the kind of thing that I enjoy doing. I think this is an excellent reference book and I would recommend it to anyone that is looking to take a step up when they are painting their vehicles. 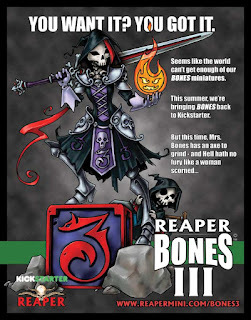 And a fascinating twist on the Reaper BONES III Kickstarter as they just hit their $1,220,000 stretch goal. Up to this point the emphasis has really been fantasy, with a couple of exceptions like the Black Corsairs (now that's some powered armor). 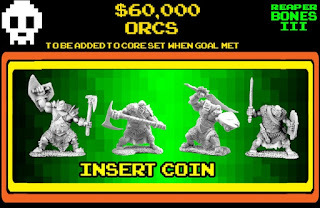 This newly revealed stretch goal is fascinating departure from what we have seen to this point. 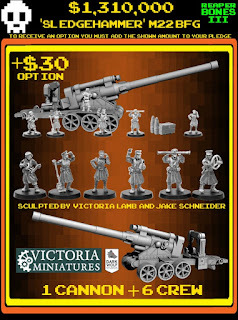 Sculpted by Victoria Lamb and Jake Schneider for Victoria Miniatures under license the "Sledgehammer" may attract quite a crowd of Sci/Fi aficionados especially those fond of the Imperial Guard from GW. I think I'll be in for at least one and maybe more depending on what the final Kickstarter price is. We will know when they hit 1,310,000 million dollars! The Sledgehammer, might even be able to use this for WWI! I really like the looks of this powered armor. I might be in for this as well. First thought here is if you don't have a title for your story do you really know what the story even is? I have run into this a number of times at competitions a person comes in and doesn't have or didn't even think about a title for the piece. If there isn't a title there isn't likely to be a good story either. 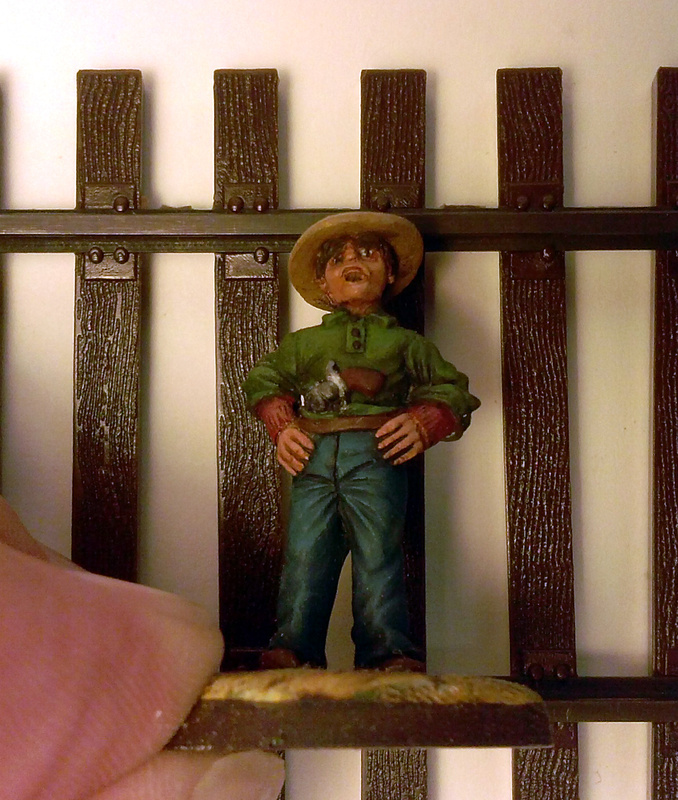 Remember the miniatures and the scene, together, have to tell the story. If you have to explain it to everyone that looks at it then you have failed. "Steady Lads! ", while there are other titles that would work I choose this title because concept was born from watching Zulu. A good story, everyone knew what was happening when they looked at it in the contest room. "Shopping II", perhaps not the best title but the scene was derived from my first version simply known as "Shopping". 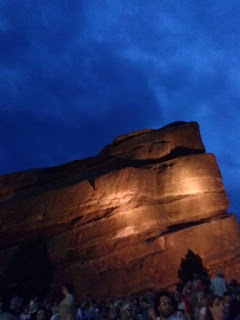 Another good story, all the elements add to the story and help establish the setting. It does suffer a bit from being to large I think. Best Hasslefree Entry at ReaperCon 2015. 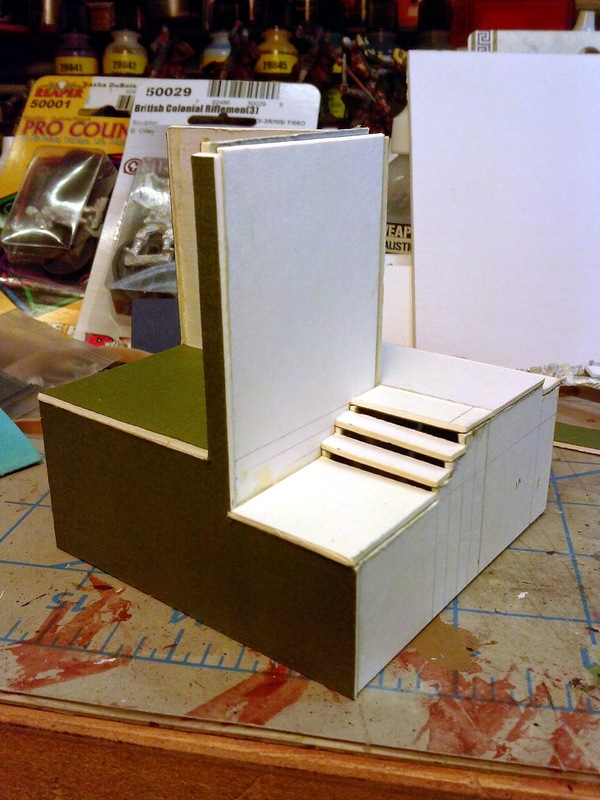 Developing a diorama around the neat base that you found at the local craft store can be an exercise in frustration. Odds are good that it will be to big and you will be filled with the desire to fill every inch of it with something. That eats up resources and time and usually does not help tell the story. Keep it small so you aren't tempted to add a lot of extra "stuff", but everything you do add should enhance the story. I allowed a commercial piece (the back wall) to set the size of the scene. Its actually to large. Adding the dumpster helped tighten up the scene by occupying a good chunk of what would have been dead space with an element that further established the location. I should be able to tell at a glance where the action is taking place. This is the foundation for your story without it the story may not be clear or even cause confustion. Setting the scene is usually not hard to do. In a modern setting it can be done with street signs and newspapers and the like. 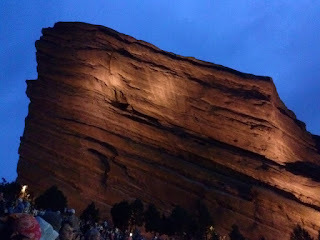 If it is supposed to convey a desert or an ice cave include the appropriate elements. Remember setting the scene can also may mean establishing a time of day or night as well. Is it morning, is it evening, did it just stop raining, is it cold, is it hot? I think this does a good job of setting the scene. The light is glowing, the shadows are long (although the shadows were just being started at this point) that gives the feeling of darkness. The posters and the street sign (missing from this picture) set the place and the date. 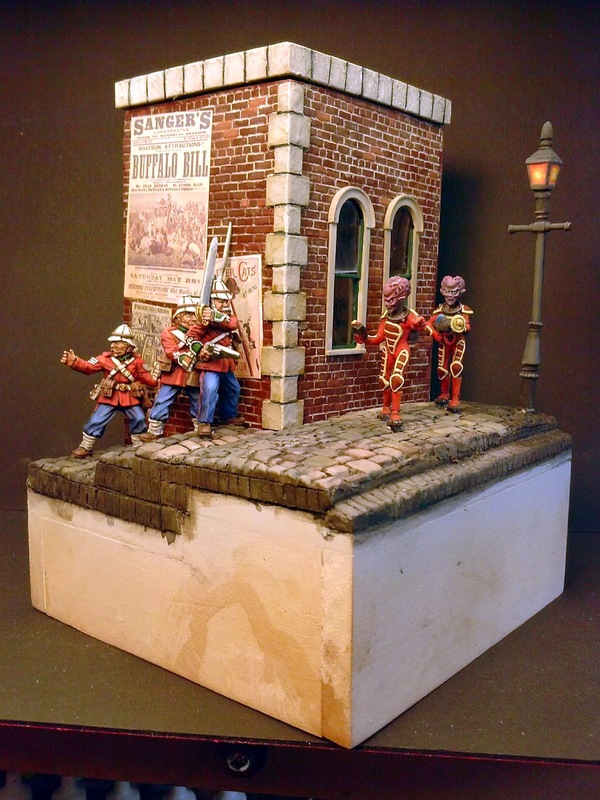 Unfortunately I managed to hide the key Jack the Ripper poster behind the soldiers. 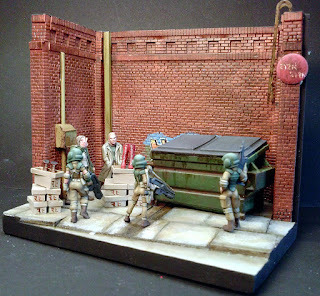 I have seen a lot of dioramas were the creator has included way to many miniatures and end up with a crowded and chaotic scene. Now there are certainly times when you want to have a crowded scene but it needs to be a deliberate choice, not “I love these minis and want to use them together” choice. 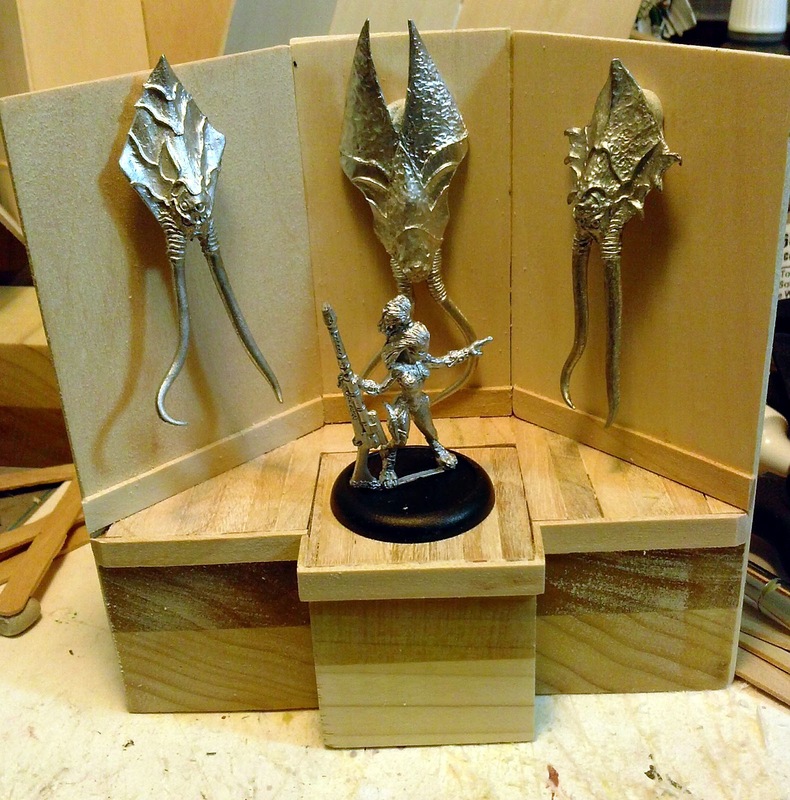 My suggestion usually is to include every miniature you want and then start removing miniatures until you remove one that ruins the story. Put that one back. Its back to the same concept of the setting the scene, if an element or mini doesn’t help the story then don’t include it. This was my initial selection for "Shopping II". 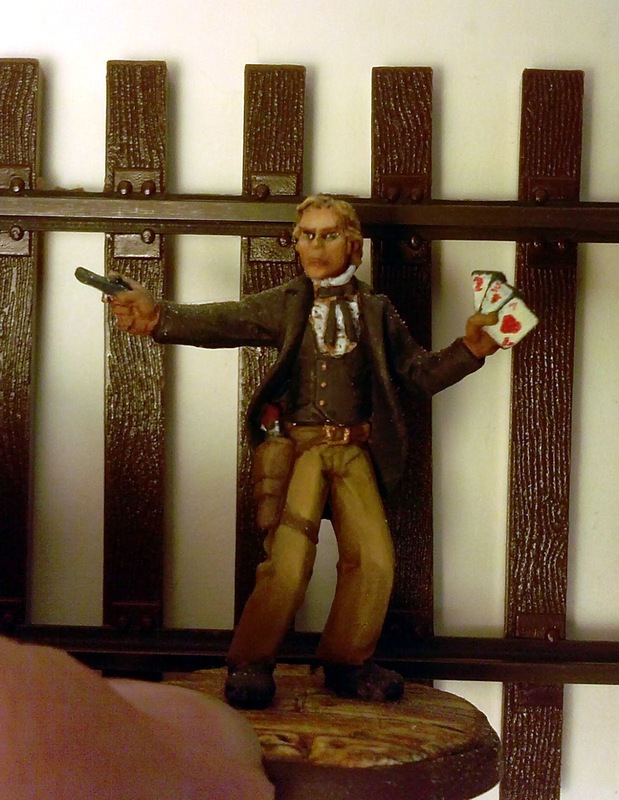 In this case I used the same female miniatures from "Shopping" and simply added the two black marketeers. 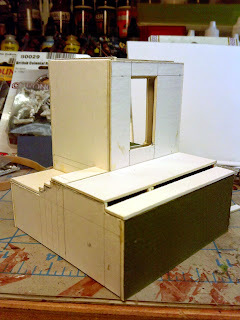 The initial figure selection for a diorama that didn't get done. I had considered adding another mini to this one but couldn't find another miniature that enhanced the story and the story is pretty solid. It doesn't have to be anything more than unpainted scrap cardboard, but it will help you with the composition of the piece including what is enough, what is to much and what is not enough. The original mockup for "Steady Lads". I wanted to be sure to include plenty of different heights to the scene to increase the dramatic tension I was looking for. In this early version the interior of the building was going to be completely hollow with one soldier inside. 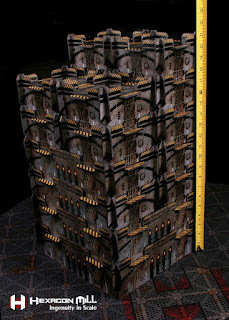 In the next iteration my friend Michael (Clever Crow Minis) recommended that the building just be solid. In the final version I went with a hollow building and placed an "easter egg" in one of the windows. In this case a woman with a rolling pin looking outside at the commotion. She is there to be a point of interest if someone is looking closely and skirts that line of adding to the story. If a viewer notices her then she adds to the story, if they don't see her then it takes nothing away from the story, but it filled a space that I thought was particularly empty. Likewise there is a rat in the alley that very few people noticed. He adds to the setting if you see him but he's not required to set the scene either. In other words you should be prepared to break the rules. Not bad but definitely needed some improvement, This may be the first time that I went to small on the first try. Now in the 2D world composition is every bit as important and maybe even more so. I was reading James Gurney's blog and he refers back to one artist's evolution of a scene today which I found quite fascinating. I think is very useful to someone contemplating a diorama of any kind and helps establish that there is nothing wrong with changing things up. So check this out and see how a 2D artist "mocks" things up and goes through different iterations before settling on the final version. 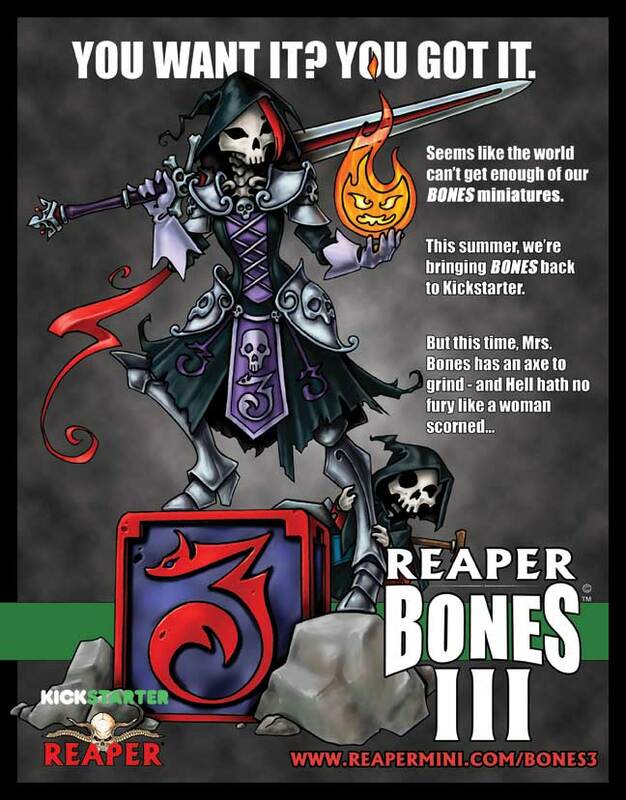 The official announcement that Reaper would have a third BONES Kickstarter was made back in April/May at ReaperCon. 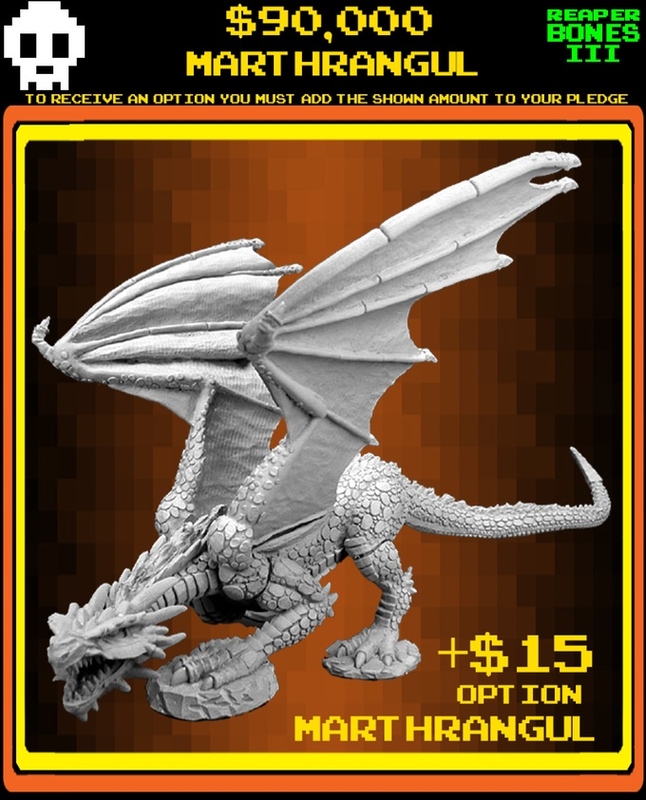 Well today is the day and for those of you interested in cheap plastic minis and even bigger plastic monsters and dragons this is a Kickstarter that you should be checking out. 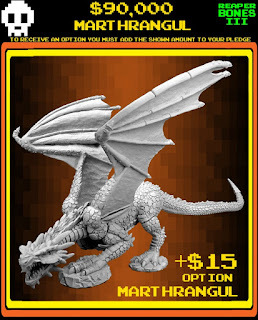 There have been pre-view pictures of some of the minis taken at ReaperCon and the biggest single debut mini, that we know of, is the Not-Tiamat a Five Headed Dragon. Who can resist a five headed dragon? The Kickstarter went live at 9am this morning and I'm curious to see where its funding level is at the end of Day 1. Reaper is also trying something different this time around and is working with a much shorter time frame 18 days instead of 30 so don't hesitate or you might miss this one. Of course there is a lot of curiosity in how quickly this little project will move along. Hit the initial funding level in about 2 minutes. 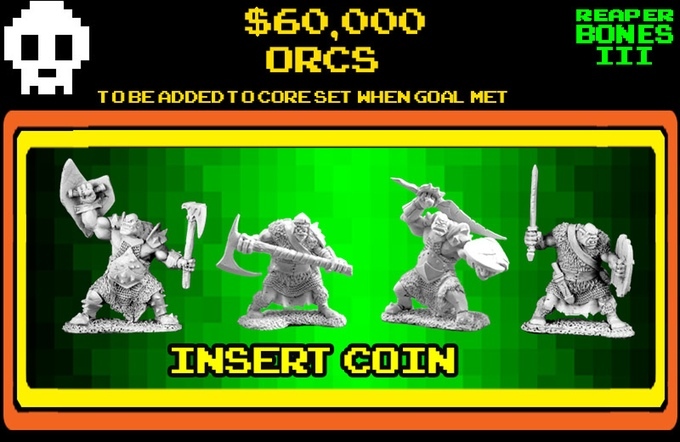 In the first seven minutes the first two stretch goals were blown away as pledges rocketed up and over the $100,000 mark. It was really moving to fast for me to keep track of. At the end of the first 35 minutes (because I forgot to look at the clock) they were at $253,000 and approx 2500 backers. And at the rapid rate of pledging and the crush on the servers Reaper couldn't get any of its own updates in. Here's a look at what the project started out with. Its only going to get bigger from here. The Core Set, which will continue to grow through out the process. As for me, my pledge was #30. 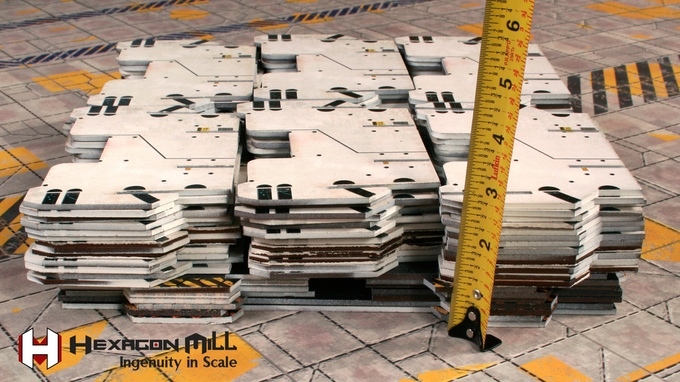 I don't push to many Kickstarters but I think this one is worthy of pushing. 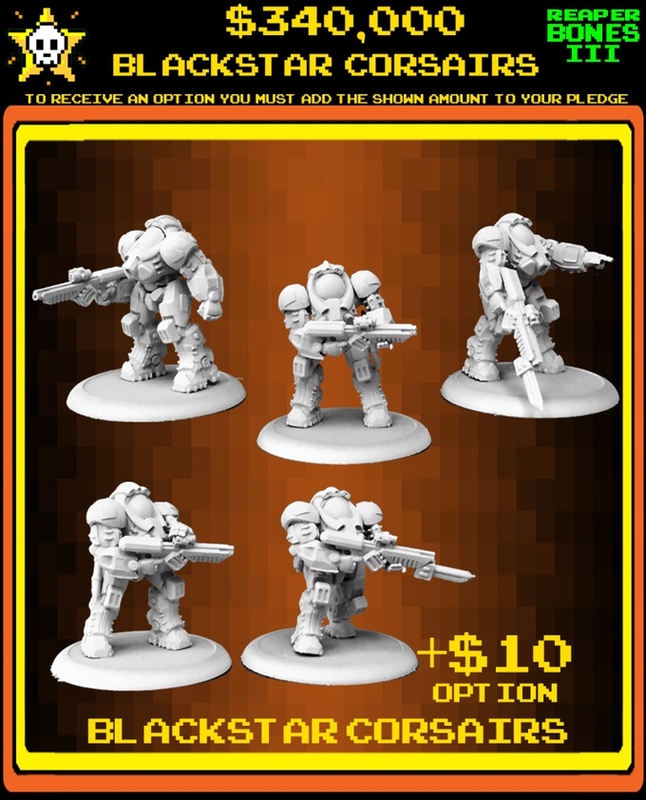 They have long since reached their funding goal but they are pushing for another stretch goal that will add another design option to your choices. 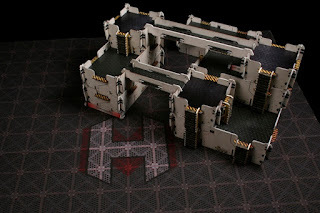 As evidenced from the title they are pushing the pre-painted and flat packable aspect of the project but looking at the pictures its obvious that the components are modular and durable as well. 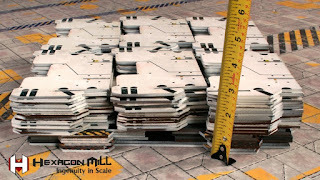 The ability to flat pack for both storage and transport is a big key to this effort and the two designs that are currently available are wicked, they reach out and say Sci-Fi to me more than anything that 40K has done and your Space Marines will still look at home with these buildings in the background. While this is a new company the backers have been involved putting together successful kickstarters before so they have the experience to pull this off. Seriously, wouldn't you like to do this with your buildings? 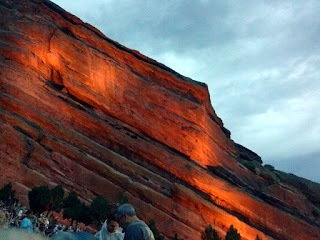 My Father's Day gift from my sons was tickets to the Blues Traveler concert at Red Rocks on the 4th of July. 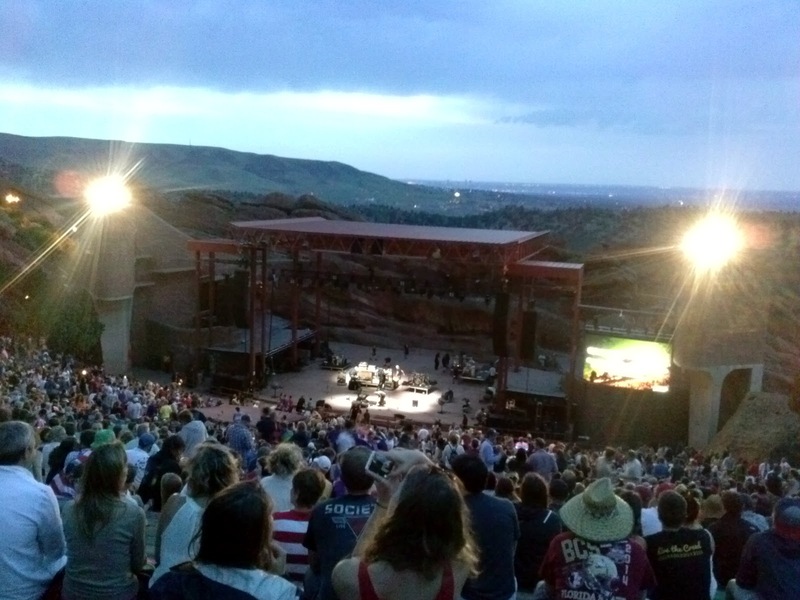 Blues Traveler has played this date for 21 years now and this was my first time to see them there. It also helped me forget that I have misplaced the decals for the TD company I was working on! 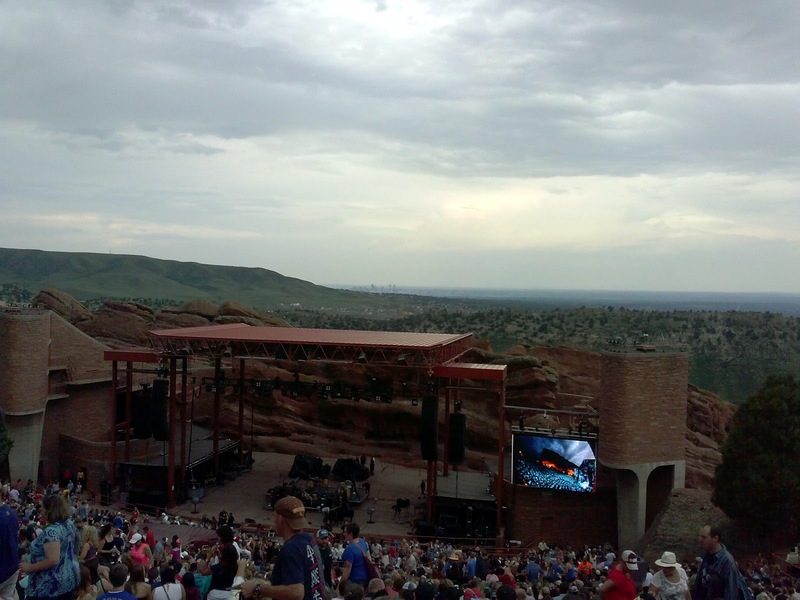 A little bit about the venue because in some ways it doesn't matter who you are seeing there, every band is better on the Rocks. If you have live here and haven't seen a show there, what are you waiting for? Red Rocks is the world's only naturally-occurring and acoustically perfect amphitheater and bands that have played there continue to rave about the experience for years afterwards. 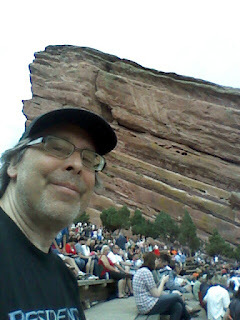 Flanked by 300 foot sandstone rocks of the Morrison formation Red Rocks seats about 10,000 and that's why sometimes the famous bands only get to play there once they have to hit that sweet spot of rising popularity that will let them play in a small venue. 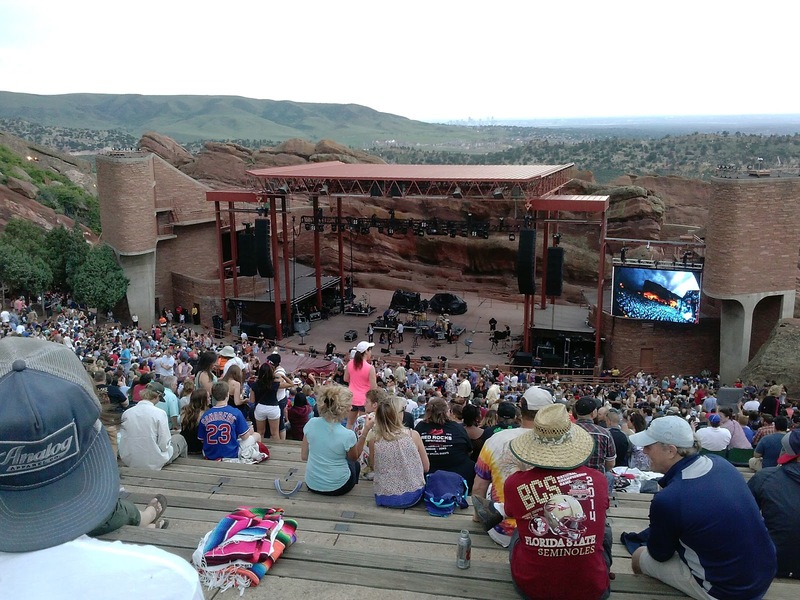 As part of the Front Range the amphitheater sits at 6450 feet above sea level and the view out across the Colorado plains towards Denver is fantastic. Especially fun on the Fourth of July as you can see the fireworks shows from all over the area going off. And the music? Fabulous! 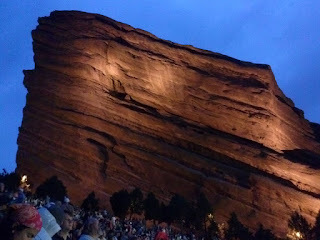 It was an awesome show by one of my favorite bands. These are rain or shine shows and its looking like I might get a little wet. The view is looking south down the Front Range. It did rain a little bit but not enough for me to pull out my jacket. 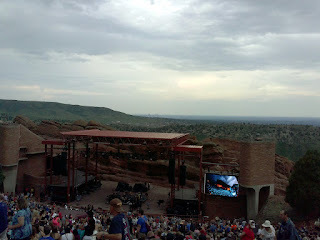 Looking north towards Red Rocks from the Upper South Parking lot. The walk up to the venue starts near the trees on the right side. And you are walking up in no uncertain terms. 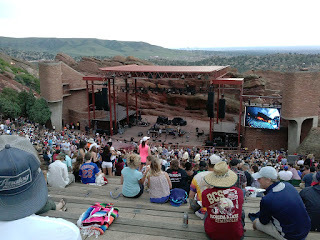 Its mostly general admission and I'm sitting about 2/3rds for the way up. 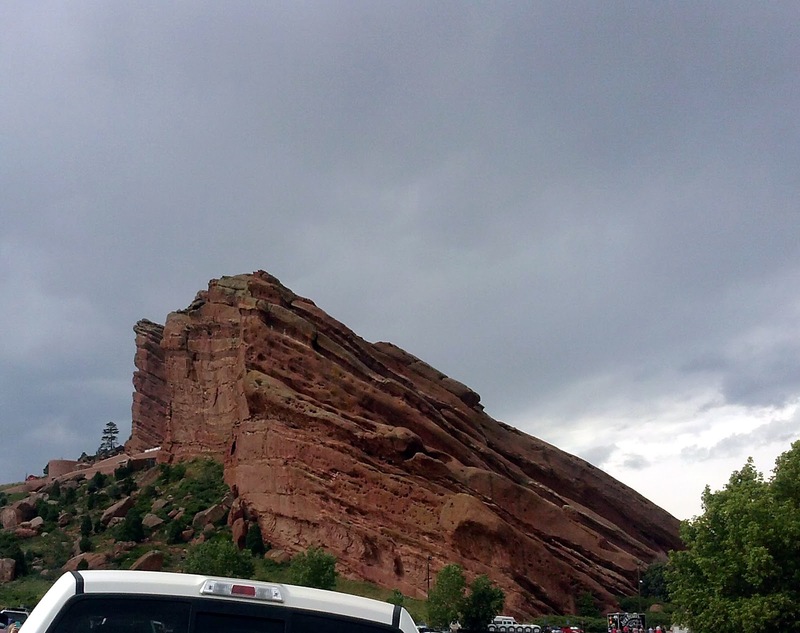 You can just pick out the Denver skyline near the left center of the photo. The stage. 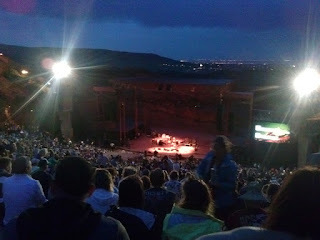 Guster was getting ready to go on when I took this shot. 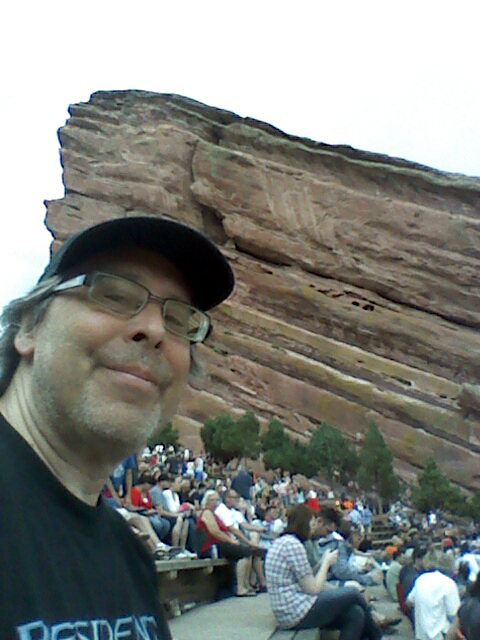 Obligatory selfie to prove that I was there! Shutting down the camera, Blues Traveler is hitting the stage!